True gold leaf gilding is a craft and skill that takes decades to hone, develop, and master. Gilding used to be much more prevalent than it is today, but there are still masters of the craft that continue to perfect and evolve the way gilding is done. Guilder is an homage to the golden age of gilded lettering and the modifiable styles that were used to embellish it. Our Guilder Types, spelled like the Dutch Guilder currency, connote the original German term for gold penny, 'Gulden'. Whatever the form of gold, we've engineered Guilder to be a versatile and sturdy industrial sans that harks to the gilded letter. 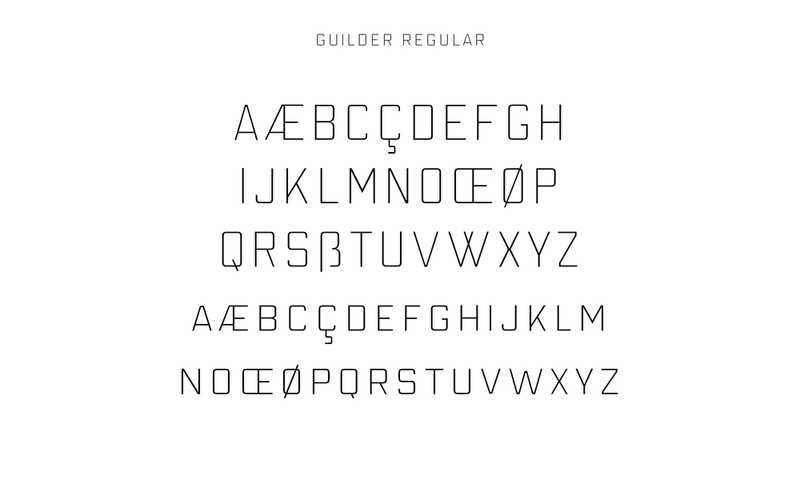 Guilder comes with three styles: Regular, Inline, and Outline, which you can layer atop one another for several different looks. The Guilder Family is great for display and editorial headline purposes and lends a certain historical flair to your page. Individual styles are priced at a special launch price of $25. Buy the collection and get all the versatility it has to offer for $60. It's easier to keep the family together. Buy all three fonts in the collection for the true experience.